BLOOMINGTON, In. – NSF International has honored founding SPEA Dean Charles F. Bonser with a major contribution to Indiana University. NSF, based in Ann Arbor, Michigan, develops public health standards and certification programs that help protect food, water, consumer products and the environment. The $50,000 gift will support the proposed SPEA Center for Cultural Affairs, the culmination of Bonser’s multi-year effort to establish IU as a national leader in the field of cultural policy and management. Bonser served as dean of the School of Public and Environmental Affairs (SPEA) from its launch in 1972 until 1989. He remains on the faculty as Ameritech Professor Emeritus in SPEA’s Institute for Development Studies. SPEA faculty will lead the Center. Its initial goals include defining and advancing the field of cultural policy and management, fostering high-quality research by a national network of scholars, and training doctoral candidates. Dean Bonser at the dedication of SPEA, 1972. 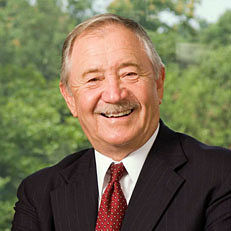 Dr. Charles F. Bonser first joined the faculty of the Indiana University School of Business in 1961 as a lecturer. Following a period of government service from 1963-65, he rejoined IU as an assistant professor and associate director of the Bureau of Business and Economic Research. In the fall of 1971, Bonser was appointed as special assistant to the president of Indiana University. In this assignment, he prepared the plan for SPEA and was appointed the first dean of the School in 1972. Bonser retired from full-time academic service in 1998, although he continues an active agenda with IU on a part-time basis. In July, 2002, Bonser was called back to serve as director of the IU Graduate Program in Arts Administration, which then became part of SPEA.